Gordon To Strike Gulf Coast At Category 1 [VIDEO] - Joe.My.God. Tropical Storm Gordon is quickly heading toward a landfall tonight along the northern Gulf Coast as a Category 1 hurricane. 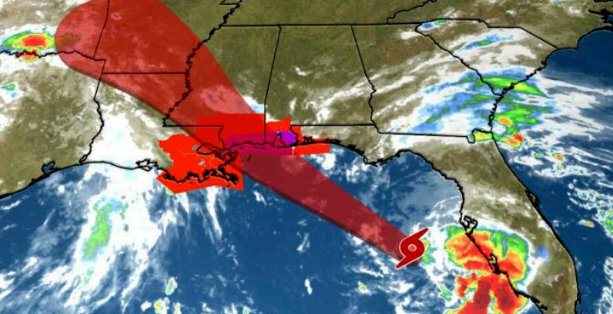 The National Hurricane Center has issued a hurricane warning from the mouth of the Pearl River, Mississippi, to the border between Alabama and Florida. Tropical storm conditions are expected to begin this afternoon within portions of the warning area, with hurricane conditions expected by this evening in the hurricane warning area. Forecasters believe it is most likely conditions will deteriorate east of Interstate 55 late Tuesday evening and through the night. A few tornadoes are possible this afternoon through tonight near the coasts of Mississippi, Alabama and the Florida Panhandle. The combination of a dangerous storm surge and the tide will cause normally dry areas near the coast to be flooded by rising waters moving inland from the shoreline.